Mike Krzyzewski isn’t one for hyperbole, but even the Duke coach can’t help but look at the roster he has for the 2016-17 season and be excited. The Blue Devils will bring a six-man class to campus that is ranked either No. 1 or No. 1A to Kentucky’s incoming freshmen and includes three top-10 players (Harry Giles, Jayson Tatum and Frank Jackson) and just last week added big man Marques Bolden. 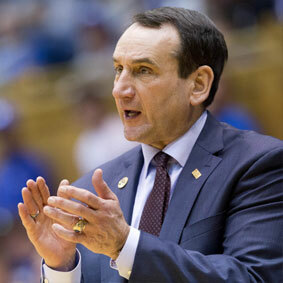 But it’s the combination of youth and experience that has Krzyzewski most excited. Grayson Allen and Luke Kennard, both starters a year ago, and sixth man Matt Jones return, as does Amile Jefferson, who played in only nine games before eventually being redshirted with a foot injury. With Jefferson’s injury a year ago, as well as Rasheed Sulaimon’s exodus, the Blue Devils often were hamstrung by a depleted roster, playing essentially five guys down the stretch and through the NCAA tournament. But with such a big class — one of the largest Krzyzewski can remember bringing in — that no longer will be a problem. Outsiders might think that balancing egos and managing minutes could be. Krzyzewski isn’t worried. Duke lost to Oregon 82-68 in a West Regional semifinal game March 24.